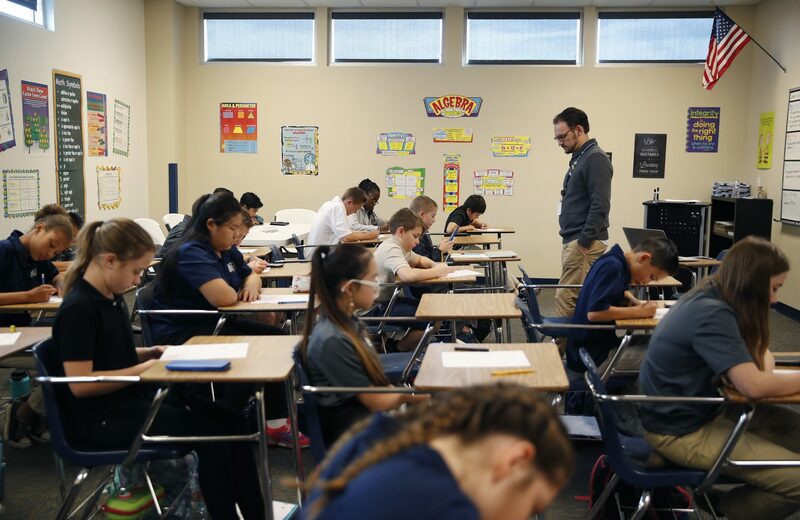 In this Nov. 16, 2017, photo, students take a quiz in Michael Briggs' seventh grade algebra class at Lake Mead Christian Academy in Henderson, Nev.
(Undated) — Pennsylvania released a list of 289 struggling schools Thursday that will have to develop “improvement plans” with the direction of state advisors. The schools will share some portion of $40 million. State officials declined to say how they will divide the money. Unlike in previous years, the state focused less on schools with low overall test scores, and included schools where certain subgroups of students failed to meet academic benchmarks. Those subgroups include economically disadvantaged students, English language learners, special education students, and “federally established race and ethnic populations,” according to the state. The new designations change the calculus for how the state defines struggling schools, drawing scrutiny to some schools that would have previously flown under the radar. Each identified school will work with a team of state officials to create improvement plans, though there’s no plan to radically intervene at schools that fail to improve. In previous iterations of this federally mandated program, schools that didn’t improve faced options that could include firing staff, closing schools, or converting traditional public schools into charters. But when the Congress replaced the No Child Left Behind Act with a new law called the Every Student Succeeds Act (ESSA), it gave states more flexibility. Pennsylvania’s new approach doesn’t mention the same sort of major changes, even for schools that stagnate or backslide. Under the new designations, schools can receive one of two labels: Comprehensive Support and Improvement (CSI) or Additional Targeted Support and Improvement (A-TSI). Most of the schools that qualify for these labels receive Title I money, a federal program that sends dollars to schools with lots of low-income students. CSI schools are Title I schools that scored among the bottom five percent in the state according to a formula that looks at test scores, attendance figures, and other data. Non-Title-I schools can qualify if they graduate less than two-thirds of their students. All CSI schools will receive a so-far-undisclosed amount of extra federal money for at least two school years, although it’s unclear whether that support will extend beyond the first two years. Schools in the second category, A-TSI, are Title I recipients that scored among the bottom five percent in at least one student subgroup. If any school has graduation rates below 67 percent in a certain sub-group they can also get an A-TSI label. In a plan submitted to the federal government, state officials said they would “continue to evaluate” whether A-TSI schools will get extra money. Schools named Tuesday will remain under state watch until 2021. In the past, Pennsylvania labeled schools as focus or priority schools, using a formula weighted more heavily toward standardized test scores. Now, some schools that wouldn’t have met the focus or priority thresholds will earn an A-TSI designation. That may sound like a semantic distinction, but it will actually change the pool of schools receiving extra support. Take Philadelphia as an example. Under the old system, 42 percent of all focus and priority schools were located in the state’s largest public school district. Now, only 21 percent of CSI and A-TSI schools are run by the School District of Philadelphia. Superintendent William Hite praised the state’s new method of designating schools, and welcomed the shift away from “draconian” interventions at low-performing schools. “We didn’t find that was, over the long haul, very beneficial,” said Hite. Under Hite’s leadership Philadelphia converted more than a dozen traditional public schools into charters, although it hasn’t converted any new schools since 2015. The district still has its own process for identifying underperforming schools, and it requires those schools to create improvement plans that can include removing teachers.